It’s been another break-neck week as the Legislature continues to plow through its work on the budget and churn through bills while Gov. 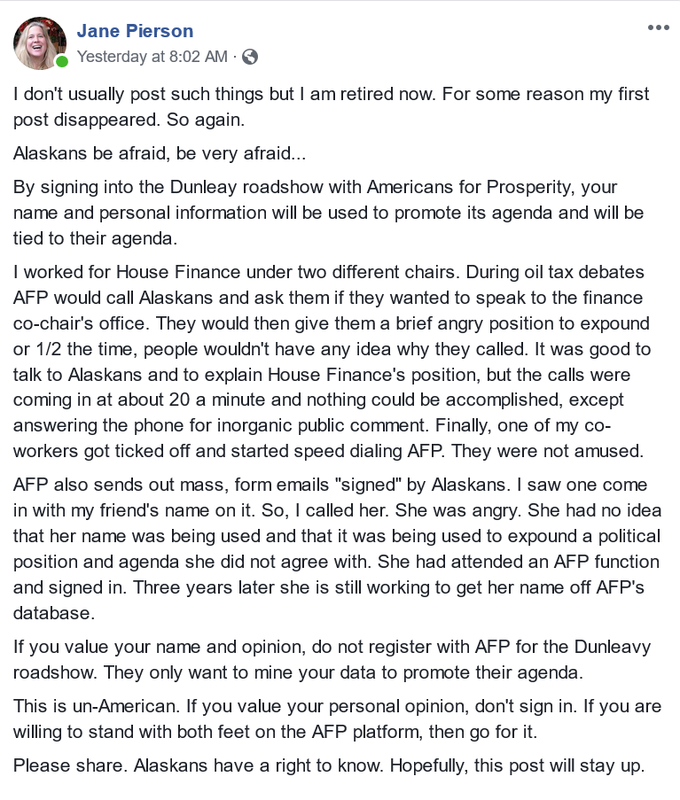 Michael J. Dunleavy does his thing and flouts the Alaska Constitution. It’s also a fun time for my computer to call it quits mid-week, leaving a lot of things that would make it into their own post or a recap to pile up all week. But, hey, at least it’s enough weird stuff to cobble together into your latest heaping helping of bizarre news from what one political appointee described in an email to legislators as “the dark wet recesses of a cave called Juneau.” Enjoy, have a nice weekend and be polite when yelling at your elected officials. The Department of Commerce, Community and Economic Development appears to be without Economic Development after the budget closeouts in the House this week. The governor’s proposal sought to move three positions in the Office of Economic Development to the governor’s office (yay for power consolidation!). It’s one of the many proposed moves—alongside the sweeping up of administrative services directors from the departments and others—that would grow the governor’s office from 159 positions to 177 positions, and has been pitched as… making economic development… more… efficient… or was it more… aligned with the governor’s… priorities? Either way, it shouldn’t come as a surprise that legislators have found the essentially non-existent justification for the move lacking. The House subcommittee on the Department of Commerce rejected the move earlier this week, but then went on to just go ahead and delete the Economic Development positions anyways. It turns out that Rep. Tammie Wilson, the Republican chair of that committee who impressed many this session with a level-headed, bipartisan approach to the budget, is still Tammie Wilson. When the House subcommittee on the governor’s office met Thursday night, there was an attempt to create the positions there—thinking that economic development must go somewhere—but Wilson and fellow legislators also rejected that move. The whole subcommittee process should really be considered a starting point so there’s potential for the money to be returned elsewhere in the process, whether it’s in the House Finance Committee, the floor or somewhere in the Senate. 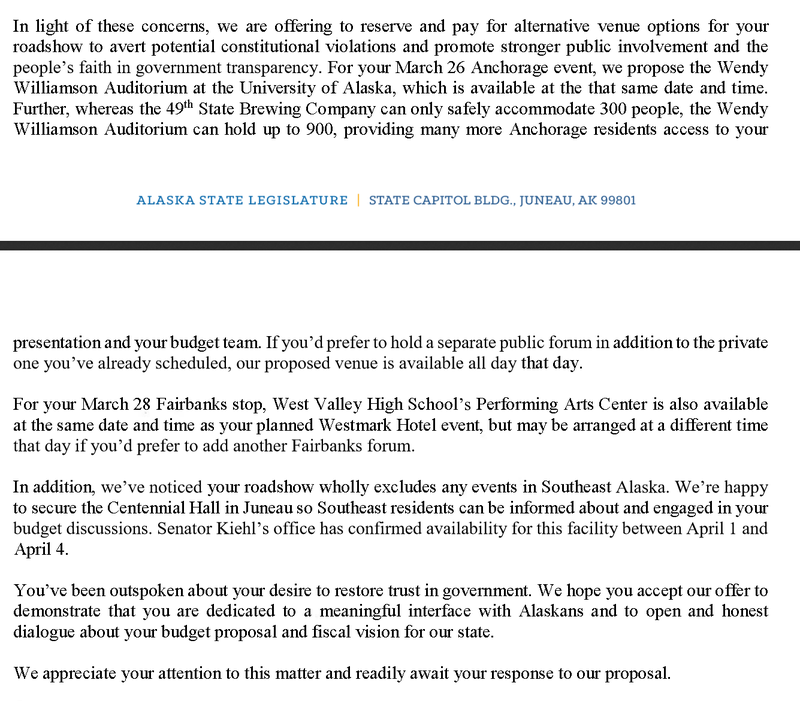 The University of Alaska has been sweating bullets as it stares down a big ol’ cut to its state funding under the Dunleavy budget. The House subcommittee rejected that during its meeting this week and instead added in another $10 million on top of that. Don’t get too excited though, the budget still has to go through the rest of the process. Also waiting at the end of the process? The governor’s line item veto power. The governor should at least be happy to see the Senate has apparently attached a rocket to Senate Joint Resolution 6, his proposal for a constitutional spending limit, with hearings next week in the Senate State Affairs Committee set for Monday and Tuesday as well as hearings in the Senate Judiciary Committee on Wednesday and Friday. The talk is the Senate is pretty confident they have the 14 votes to get it passed, which is why they’re rushing it through. It’s not altogether surprising given the Senate’s attention to the statutory spending cap (which doesn’t set any real limits because it’s just statute) last year, but Dunleavy’s proposal is a fair bit stricter than what Senate Republicans pushed last year. Gov. 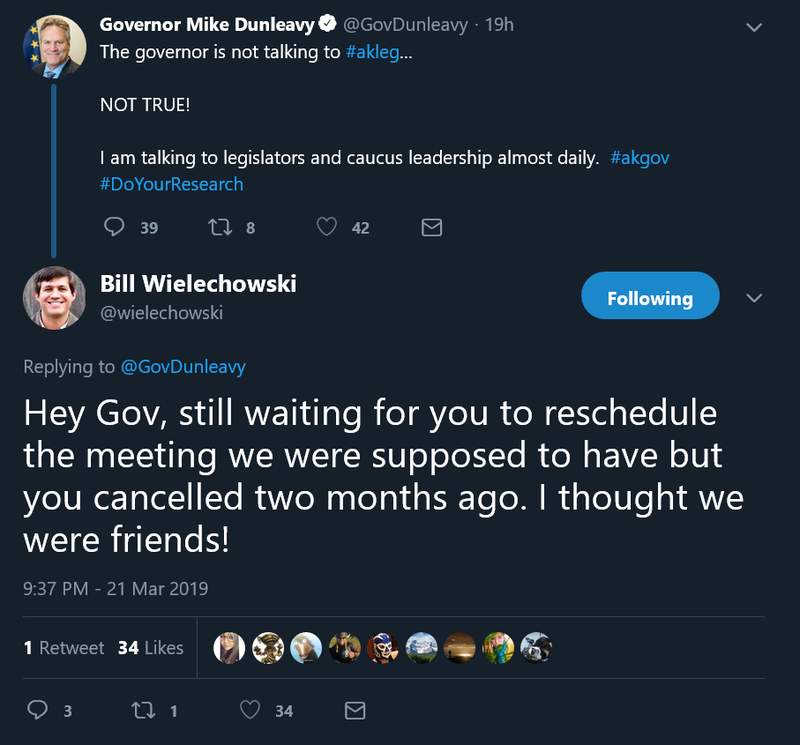 Michael J. Dunleavy is ignoring his constitutional obligation to fill a vacancy on the court because he didn’t get his pick and is also allegedly blocking Public Defender Quinlan Steiner from testifying. It’s enough for House Judiciary Committee Chair Matt Claman to announce he’s delayed a hearing on House Bill 49, which was scheduled for Friday, until Monday. We don’t get to hear a whole lot from House Speaker Bryce Edgmon because he’s up at the front of the class during the floor sessions, but he’s been particularly busy this week with the Special Committee on Tribal Affairs and the House Finance subcommittees. Edgmon started the week out by taking Department of Public Safety Amanda Price’s framing of the Village Public Safety Officer programs to task during the Special Committee on Tribal Affairs. Edgmon took issue with previous statements and presentations by Price that suggested the VPSO program was either roughly equal to or more expensive per position than troopers, just as the state is pushing ahead with cutting VPSO funding. “What I took from that almost seemed to be an indifference on your part to the program,” he said. Price said that wasn’t true and that she really, truly valued the VPSO program and would be soon releasing a plan to solve some of the problems with the program, like recruitment and retainment. Price then went into a lengthy and buzzword-filled response about how improving rural public safety might not be through the VPSOs that she didn’t get to finish. To which Price got testy. “Rep. Edgmon, did you not hear me make the statement earlier that on April 25th we’re working with the grantees to deliver what our plan is on the village public safety officer program and how to strengthen it,” she said. Amidst the budget battle described in this post’s first item, Edgmon used the opportunity to criticize the administration’s decision to sweep up every department’s administrative services directors—the folks responsible for implementing the budget on a department level—under the tutelage of Office of Management and Budget Director Donna Arduin. It’s a point that at least had the agreement from Republican Rep. Chuck Kopp. Also, for those who’re keeping track: Rep. Sarah Vance’s now-deleted video bashing high school students and the education system on their letter-writing abilities was made right after having a meeting with Dunleavy. FROWNY FACE! And if you weren’t already concerned about the involvement of the Koch Brothers-funded group, former legislative aide Jane Pierson shed some light on the whole thing too in a post that’s now been widely circulated. In the comments, you’ll find plenty of other staffers and legislators agreeing about the group’s shady tactics. Earlier this week, Trevor “To my own detriment” Shaw withdrew from consideration for the Alaska Commission on Judicial Conduct after legislators let it be known that they were not particularly enthused about appointing someone who faced a voter-initiated recall over his handling—or lack thereof—of sexual assault claims against a now-convicted Ketchikan School District teacher. Shaw dismissed it during his hearing as a union conspiracy that involved both The Midnight Sun and The Alaska Landmine, a point to which Landmine Editor Jeff Landfield testified against (he was in the room), because of some labor contract disputes. It was the first time we heard about labor contracts. That’s laughable given the most damaging line of questioning Shaw faced came from Sen. Pete Micciche, R-Soldotna. “It seems like you were on the board for all seven incidents. As a parent, I’m struggling to see how the individual made it through report number two without losing his job. There are some details here that are disturbing that were largely ignored,” he said. “By 2013, as a parent and a policymaker, this person should have been removed that day from his service and should have never been allowed in an Alaska school again. Anyways, Dunleavy then appointed Fairbanks resident Hank Bartos to the position. At which point pretty much every one of my Fairbanks contacts popped in to remind me of all the legal problems Bartos has found himself in, including an ongoing lawsuit that accuses him of getting rich off his involvement off state grants to the non-profit Ice Alaska. When the Courtview page has to be paginated into two pages, perhaps you should look elsewhere… or maybe that was a qualification. Word is he’s already out. Hey, at least that might be a record. It’s never enough to have just one appointment controversy in a week, so of course we also need to address the latest disastrous hearing for one of Gov. Michael J. Dunleavy’s appointees that left us once again asking: Who’s vetting these people? The latest case is the House Labor and Commerce’s Monday confirmation hearing with Real Estate Commission appointee Michael Tavoliero, the Republican district chairman of House Districts 13 and 14. Legislators grilled the Eagle River resident over a bizarre email he sent to every legislator a few days before the hearing, a “very abbreviated resume” with a 30-year gap that also left out the name of his current employer as well as a series of tweets that one legislator said made it look like Tavoliero endorsed the violent eradication of Muslims. It was a truly bizarre meeting that saw Tavoliero frequently get testy with legislators, ask how their questions related to the position, offer detail-free responses, and frequently correct legislators’ pronunciation of his last name. The first line of questioning focused on email exchange Tavoliero had with the entire Legislature where he said “There lies the frailty of opaque state government in the dark wet recesses of a cave called Juneau” and wrote “Lol…says the hound as he runs with the fox” to a reply from Sen. Jesse Kiehl. Tavoliero’s resume had a 30-year gap between his education and his current job as a real estate licensee and associate broker. One legislator described it like “pulling teeth” to find out that he actually owned a transmission shop for some portion of those 30 years, the name of his current employer or the little fact that he’s also currently developing real estate in the North Pole area. He blamed his “Philippine virtual assistant” for a series of tweets praising Rodrigo Duterte, the infamous president of the Philippines, and one that said “You can’t be polite or tolerable of those who blindly and deftly want to kill you. Our only option is to destroy them” after retweeting a bunch of Islamophobic tweets. The AKLedger has a full breakdown of the action. 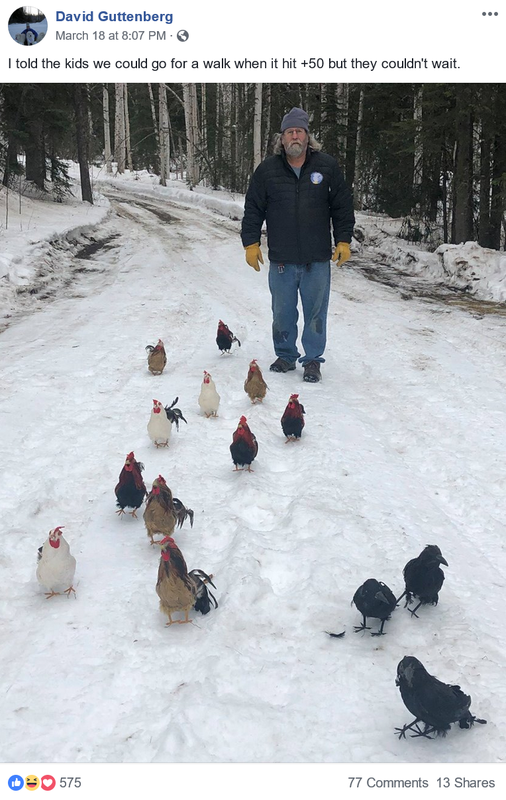 While other former legislators have kept busy by filling editorial pages, running for local office or getting fired by Dunleavy under dubious reasoning, former Rep. David Guttenberg is living the best life. Be the first to comment on "Friday in the Sun (March 22): The Catching Up edition"